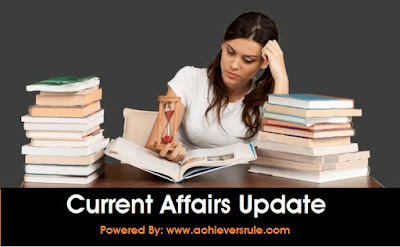 Read Daily up-to-date/ Updated Current Affairs & Current Affairs Quiz/MCQ from Achieversrule.com and SCORE good marks in your upcoming Banking Examinations, Also we request all viewers to Go through our updated Banking Schemes & Current Affairs Articles to Keep Updated in all respect. You can also download our Monthly Current Affairs PDF. New computer virus "GoldenEye or Petya" spreads from Ukraine to disrupt world business. In order to reach out to maximum eligible voters, the Election Commission of India (ECI) is launching a ‘Special Drive to enrol left out electors, with a special focus on first time electors from 1st July, 2017, so as to move in the direction of Commission’s motto that ‘NO VOTER TO BE LEFT BEHIND’. The ECI is collaborating with Facebook to launch first Nationwide “Voter Registration Reminder” on 1st July, 2017. With over 180 million people in India on Face book, the ‘Register Now’ button is designed to encourage Indian citizens to register themselves with the Election Commission of India. On 1st July, a notification of the “voter registration reminder” will be sent to people on Facebook in India who are eligible to vote. The reminder will be sent out in 13 Indian languages – English, Hindi, Gujarati, Tamil, Telugu, Malayalam, Kannada, Punjabi, Bengali, Urdu, Assamese, Marathi and Oriya. Five decades since it heralded a transformation in the way people obtained and used cash, the world's first ATM was turned into gold for celebrations of its fiftieth anniversary. The brainchild of Scottish inventor Shepherd-Barron, the first ATM (automated teller machine) was opened on June 27, 1967 at a branch of Barclays bank in Enfield, north London, the first of six cash dispensers commissioned by the bank. Equipped with multiple phone lines and computer systems and manned by tech-savvy youngsters, a "mini war room" has been set up in the finance ministry to deal with crises related to the implementation of GST. Stating this, the Vice-chancellor of the Odisha University of Agriculture and Technology (OUAT) Surendra Nath Pasupalak said that the first of its kind blood bank would be established on the premises of OUAT at an estimated cost of Rs. 3.25 crore. Mr. Pasupalak said a proposal in this regard was earlier submitted to the National Agriculture Development Programme (NADP). After approval from the NADP, the OUAT is now awaiting approval from the state government. The project will have a 60:40 sharing between the Centre and the state government, the OUAT VC said. "It is equipped with new air defense, anti-missile, anti-ship and anti-submarine weapons," Xinhua said, without giving further details. Liveris and Godrej were presented with the prestigious annual award yesterday at the USIBCs annual gala. Both were honored for creating inclusive business environments, integrating India in the global supply chain and advancing core values such as manufacturing, innovation and scale in tough market conditions, the USIBC said. USIBC president Mukesh Adhi credited the two industry leaders with making tremendous strides in their businesses. "They are indicative of the power of private enterprise in building strong ties between India and the US," said Aghi. Drug price regulator NPPA today announced provisional ceiling prices of 761 medicines, including anti-cancer, HIV, diabetes and antibiotic, with a majority being reduced ahead of the GST implementation. The National Pharmaceutical Pricing Authority (NPPA) said however that the actual increase or decrease in prices after the rollout of new indirect tax regime is expected to be in be in the range of 2-3 per cent depending on states. "In order to facilitate smooth implementation of GST for companies, we have worked out the provisional ceiling prices of 761 formulations," NPPA Chairman Bhupendra Singh told PTI. It has become a major cultural hub, drawing in huge crowds to its literary festivals, and on Tuesday Sharjah achieved global recognition as it was named World Book Capital by Unesco. The accolade came amid efforts to encourage reading in the UAE and across the Middle East. "We are so proud to have been recognised on a global scale for literary excellence and having our name being put on the same platform with some of the world’s frontrunners in the world of books and reading," said Sheikha Bodour bint Sultan Al Qasimi, president of the Emirates Publishers Association and head of Sharjah’s World Book Capital Organising Committee. "This signals a fruition of the momentous project that was established four decades ago by the vision of Dr Sheikh Sultan bin Mohammed Al Qasimi, Supreme Council Member and Ruler of Sharjah." Sharjah will be World Book Capital for 2019, following on from Athens next year. Other host cities include Montreal and Madrid, the first in 2001. With the slogan Read - You Are In Sharjah, the programme focuses on six themes: inclusivity, reading, heritage, outreach, publishing and children. City-based astrologer and numerologist TS Vineeth Bhatt has been conferred with the 'Best astrologer of the world' award at the 'Russian-Indian economic dialogue' round-table meet held in Moscow on Friday. The event was organized by Hyderabad-based man awarded 'best astrologer of world'. This article is published at 26 June 2017 09:53 from Hyderabad News Headlines, click on the read full article link below to see further details. Uttarakhand was conferred with the award of excellence at the 2nd Global Skill Development Summit held in Paris recently for innovations and extensive use of IT for skilling the state's youth. Project Director of Uttarakhand Skill Development Committee Pankaj Kumar Pandey received the honour on behalf of the state on the concluding day of the event on June 23, an official release said here today. Speaking at the event held at the Indian embassy in Paris, Uttarakhand's Finance Minister Prakash Pant highlighted steps initiated by the state government to promote skill development in Uttarakhand. Sri Lankan fast bowler Lasith Malinga has received a suspended one-year ban after pleading guilty to comments he made to the media in breach of his contract, the country's cricket board has said. The 33-year-old's sanction will be suspended for six months and he would also lose 50 per cent of his match from the next one-day international he plays in case of a similar breach, Sri Lanka Cricket said in a statement. Former India hockey captain Dhanraj Pillay will be conferred East Bengal football club's highest honour -- Bharat Gaurav -- at its foundation day ceremony on August 1. "Pillay's contribution to Indian hockey is immense. We have chosen him for this year's Bharat Gaurav. The club is honoured and humbled that he has accepted our request and will be present here for the Foundation Day on August 1," club secretary Kalyan Majumdar said today. One of modern day Indian hockey's biggest stars Pillay has the distinction of representing India at four Olympics, World Cups, Champions Trophy and Asian Games in his career spanning over 15 years. He made 339 appearances for the national team and scored 170 goals. The East Bengal club has chosen former India footballers -- Syed Nayeemuddin and Subhas Bhowmick -- for the Lifetime Achievement Awards at the function. 6th Joint Trade Committee Meeting between India and Myanmar. The 6th India Myanmar Joint Trade Committee (JTC) Meeting co-chaired by Smt. Nirmala Sitharaman, Minister of Commerce & Industry from India and Dr. Than Myint, Union Commerce Minister from Myanmar was held on 27th June 2017 at New Delhi. Vidya Balan On Being Ambassador Of The Indian Film Festival Of Melbourne. This year, Vidya Balan returns as the ambassador of the festival. Speaking about her association with the festival and the theme of diversity with a special focus on films by female directors, Vidya said, "I am excited by the number of female directors and writers who have their work showing at the Festival. Over the past few years, a new generation of female Indian filmmakers has begun to shine on the global stage. To see women behind the camera and creating powerful pieces of art is reflective of the positive steps that the film industry in India and the subcontinent are taking." President Donald Trump has appointed Indian-American Krishna R Urs as the new US Ambassador to Peru.